offers many options of where to stay. Hotel Méridien N’Fis: Large rooms with many facing a beautiful garden full of local plants and flowers, Booker’s favorite hotel breakfast, the nicest bellmen who looked really cool handling a surfboard. Amazing. Riads are Moroccan mansions that resemble Roman villas, with an internal garden/courtyard, high walls and a fountain. Although they were originally built for private use, many Riads are now used as hotels, restaurants and boutiques. Many of them are also foreign owned, including two out of the four places we visited. Thank you to La Sultana for inviting Booker for his last meal in Marrakech. The hotel is made up of four riads that have been put together. As a result, each building has its own theme with incredibly detailed décor. The restaurant at La Sultana offers very sophisticated Moroccan dishes. Their pigeon pastilla was one of the best things Booker ate on the trip. 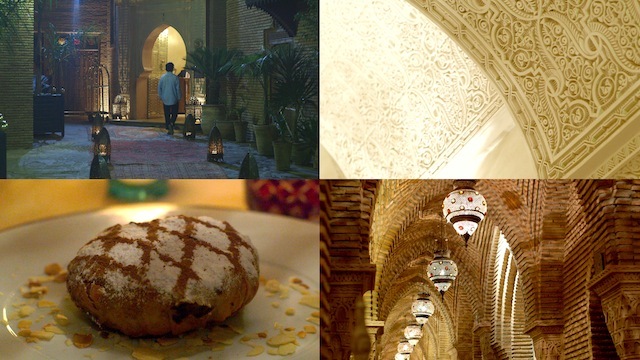 We stayed at Riad Camilia last October and loved every moment of our visit. From the second I booked the attentive nature of Nicolas, the house manager, made this a very special trip for us. The luxury nature of this Riad means that you feel completely relaxed even though you are only moments away from the boisterous souks and energetic heart of the medina. The food is divine and the staff are fantastic. I would highly recommend this Riad to anyone who is considering a stay in Marrakech.